Plant-eating dinosaurs 150 million years ago were super speedy eaters and could efficiently remove leaves from branches before swallowing the greenery whole. The research, published in the journal Naturwissenschaften, helps to explain how some of the largest animals on Earth managed to eat such amazing quantities of plants. The study focused in particular on Diplodocus, which probably could have won speed eating contests today. This massive beast measured nearly 100 feet in length and weighed over 33,000 pounds. “Diplodocus would most likely have fed predominantly on leaves, either biting them off -- much like how we use our incisors — or raking their teeth along a branch, shearing leaves off the branch,” lead author Mark Young told Discovery News. Young, a researcher in the University of Edinburgh’s School of Geosciences, and his team made those determinations after creating a 3-D model of a complete Diplodocus skull using data from a CT scan. The model was then biomechanically analyzed using a technique called finite element analysis (FEA) to test common feeding behaviors. FEA is widely implemented to do everything from designing airplanes to making orthopedic implants. It revealed the various stresses and strains acting on the Diplodocus skull during feeding to determine whether the skull or teeth would break under certain conditions. “Using these techniques, borrowed from the worlds of engineering and medicine, we can start to examine the feeding behavior of this long-extinct animal in levels of detail that were simply impossible until recently,” Barrett, a paleontologist at the Natural History Museum in London, said. 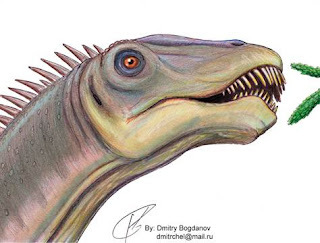 The research shows that the skull and teeth of the toothy, iconic looking dinosaur were biomechanically suitable for biting off leaves, raking through branches, and breaking off leaves. The dinosaur did not rip bark from trees, as some living deer do today. The study sheds light on how the heads of all animals, including those of humans, evolved. The findings reveal that skull shape is not just influenced by resisting the bite forces produced during jaw closure, but also food procurement. In the case of Diplodocus, this was branch stripping.